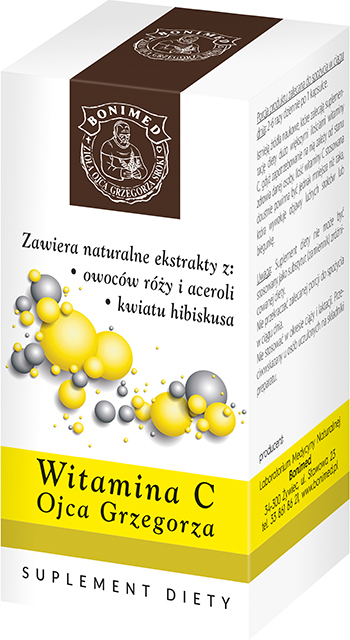 Because it contains vitamin C, the product supports proper functioning of the nervous and immune systems. It protects all the cells in the body against oxidative stress. It also reduces tiredness and fatigue. Vitamin C boosts collagen production, which, as a result, ensures a proper functioning of skin, blood vessels, gums, bones, cartilage, and teeth. Supplementation with vitamin C can also increase the absorption of iron, as well as it helps in the regeneration of the reduced form of vitamin E.
• Sodium L-ascorbate is gentle on the stomach because it doesn’t acidify stomach contents. • Sodium L-ascorbate is of pharmaceutical quality. • The product contains natural extracts of rosehip, acerola cherry, and roselle. Recommended daily intake of the product: 1–2 capsules 2–3 times per day. Some academic sources recommend supplementing your diet with a lot higher doses of vitamin C because the amount of vitamin C that you need depends on your health condition. The amount of vitamin C taken by mouth should be smaller than the amount which causes loose stools or diarrhea. Caution: Dietary supplements should not be treated as a substitute (replacement) of a varied diet. Do not exceed recommended daily intake during the day. If you are pregnant or breastfeeding, don’t use it. Don’t use it if you are allergic to the product ingredients. A healthy lifestyle, including a balanced diet is the best way to maintain good health.